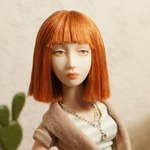 As most of you know I've been commenting a lot about wanting to start making porcelain BJDs. Well yesterday, I finally bit the bullet, found a tutorial at Woodland Earth Studio by Allison Mecleary. I'm going to be going through the tutorial with baby steps and any tips and tricks you pros can offer me would be so, so helpful. I want to put my experiences down here in this thread as I go along so that I can look at the finished product and see where I came from. I also think it will be helpful for other newbies like me that want to see what I've done and how they can do it themselves. Alright so first thing's first: The drawing. I used the tutorial at the WES on doll proportions. Factoring in shrinkage for porcelain, I decided a tiny bit over 18 inches was where I was going to start. The doll is likely to be 15 inches, ish, I'm assuming by the time the process is done. 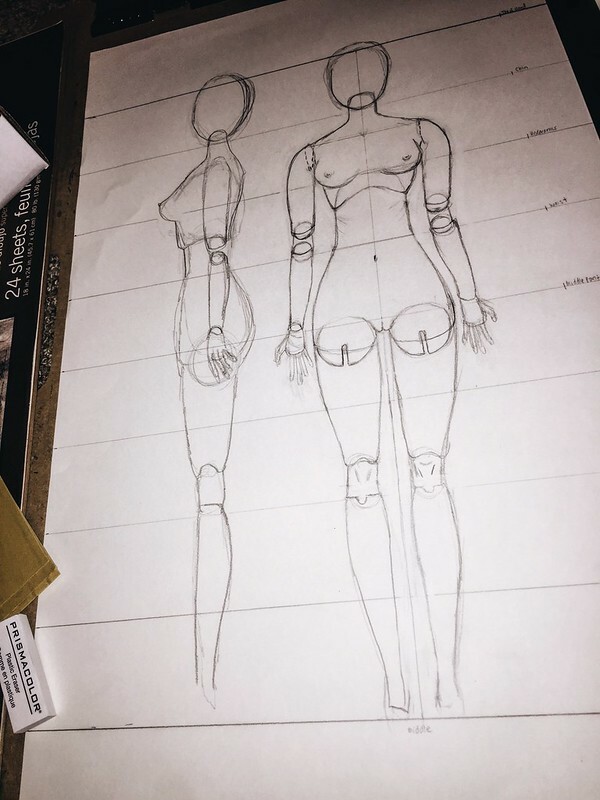 Anyways, I looked at the reference photo on the page that shows that proportions of the female body divided in to eight sections. I divided my paper in to 8 sections of 2.25 inches a section. Then I labelled the sections to show which body parts are level with each section. This helped me to figure out proportions. I sketched first to match all the regular proportions for the ideal female form. Then I went in with artistic liberty and made things smaller and larger where I wanted to. 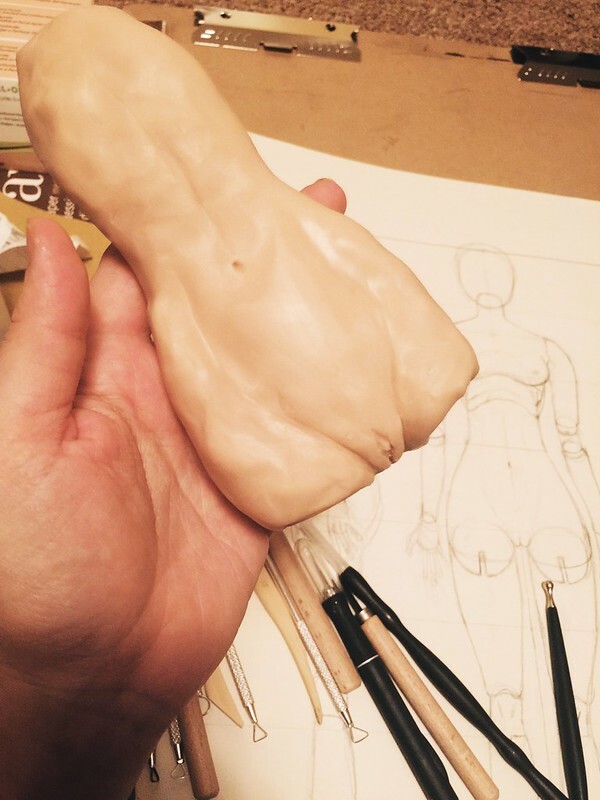 Finally I found a few drawings of BJDs on the internet and their different sections and it helped me to figure out where the pieces would be cut and roughly what double joints looked like. I'm obviously nowhere near completion even at this stage (I don't even have the correct size of wooden balls for this yet for the thigh joints). I don't know what I've gotten myself in to, but I'm really excited. 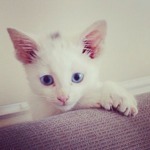 When I'm keen on something, I'm keen! So... good lord. Let's get this show on the road. Also, I will need to buy a kiln at some point, so could you all who have experience making dolls, could you suggest a good kiln for me? Obviously not too small, and I want it to be automatic. The easier to use the better and preferably under $1500 US. Thank you thank you! Your drawing looks great! I like the proportions overall, although the hands seem small to my eye. It depends on the style you are going for. I like big hands. You make me miss my own work trying to make a doll. I gave for now up due to lack of time. I am in the middle of growing my other business for my day job and I needed more focus. But I miss the sculpting work. So fun! I was also using the WES tutorial. I am no pro, but I think you should not worry about it being completely smooth too much yet. You can sand it at later points in the process. Also you might want to try Super Sculpey of you are using regular Sculpey. The properties are better for doll making. This is so exciting! I will be watching. allurose Thank you so much for your feedback! I haven't finished the hands yet, I think, as with my drawing sketches, hands will be the hardest. I also like long, elegant fingers so that has to be right too! Will work on those longer. I'm also taking your suggestion about sculpey. I'm going out to buy some super sculpey today because I want to see the differences. 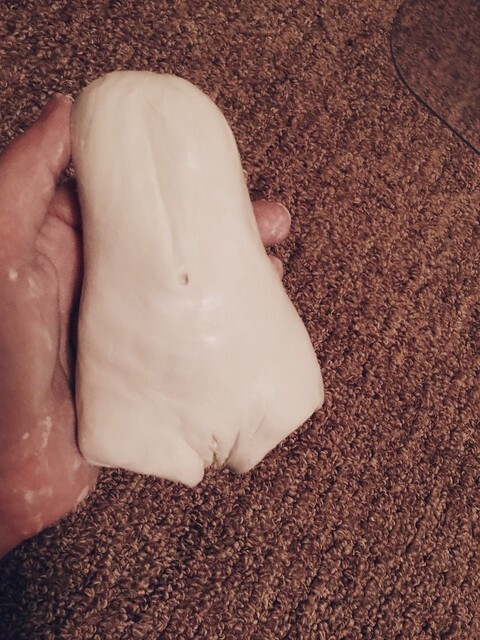 I can always use this sculpey for armatures, which I didn't do when tentatively sculpting this test piece. Also, you should pick it back up and we can be doll-buddies! Once my day job is stabilized I do intend to work on my doll. But right now I work 40-60 hours a week and it's just not possible! I wish. 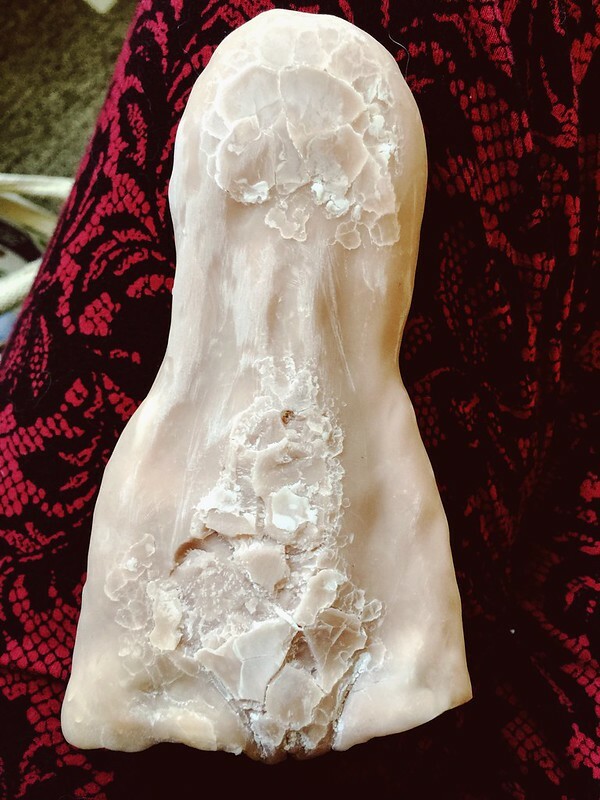 I agree with Allurose about the sanding of sculpey. Minor flaws can be fixed when you sand it at the end. There is a product I like for working on fine details like eyelids and lips though. It's called liquid sculpey. It comes in a bottle with a squeeze top but I prefer to use a small paint brush. 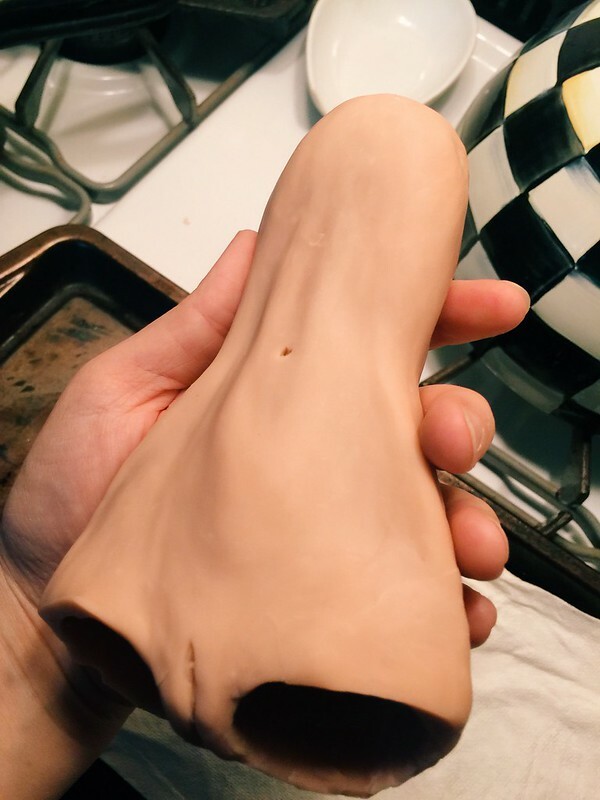 It will stay liquid till you bake it and can make nice definition where it's hard to sculpt. It's also really nice for adding fingernails. I am also trying to make my own dolls but it is slow going. I am also interested in a small kiln and would like to hear the feedback you get from others that have one already. 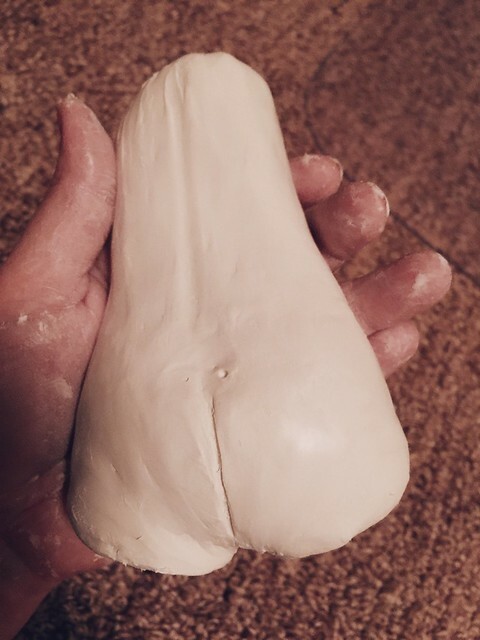 Good luck on your sculpting. I hope to see more soon. So, here's my update. I hope you all don't mind that the updates won't be me flying through this project. Baby steps. But I still want to record all my experiences because maybe they can help others avoid some of the mistakes I'm, yes, already making. Okay so here's what happened. After allurose suggested that I try Super Sculpey, I went out and bought some. After working with it, I realized immediately that I was being stupid to try and use the other sculpey. So pro tip #1 use super sculpey or something other than original Sculpey. Original Sculpey got ALL over my hands. Super Sculpey is clean and stiffer so it's easier to work with. It also still imprints when I hold it but that's fine because it's not as extreme as with the other. I did however make armatures with the old sculpey to work off of something instead of all clay all the time. I may try tin foil in the future as suggested, but so far I just want to keep to what I've started with. Then it came time for baking. I was worried about the side that was laying on the pan would get smushed, so I looked online and found out that it was suggested you use cotton batting or a pile of cornstarch to prevent that damage. I didn't have the cotton so I used the cornstarch and popped it in. I took it out a little earlier than the suggested 30 minutes (it was thick clay with a relatively small armature inside) and it looked great. Then I turned it over on to it's back and saw it's WHOLE stomach was destroyed. I have to admit - this was my first big moment of defeat. I didn't let it get me down though. I did give up for the night but I went back at it this morning. I used my exacto knife to carve off the bigger junks of damage. Then I smoothed new clay over it. I spent a lot of time fixing the leg holes (they had all kinds of problems because I took the beads out before cooking). Bear in mind I have not sanded this yet or used alcohol on it for smoothing. This is just the raw baked version of my sculpt. I am very happy with the results. Tomorrow I plan to work on the upper torso and start to see a more complete body shape. Thanks issilyn for the liquid sculpey suggestions. Ordering some to use when I get to the fingers and head! Thank you for sharing! I always find the process of making a doll absolutely fascinating! Wow. I have used cornstarch regularly and that hasn't happened like that. I use a small Deni convection oven with a terra cotta planter bottom with dry cornstarch in it. I cover the planter bottom with foil (otherwise the fan would blow the cornstarch all over) before cooking. I try not to make the layers too thick before cooking. The only time I have had that happen is with the liquid sculpey because it gets the cornstarch wet. You were mentioning using alcohol to smooth the sculpey out, was it still damp when you put it in? Wet cornstarch sticks to the sculpey and globs up. I hope that helps you figure out what happened. I also had my adventures with the Original Super Sculpey -awful stuff! then I used Super Sculpey Firm (grey clay) and that made a huge difference! I also just used the better stuff on top of the original sculpey pieces to save the clay. Awesome work so far! I love the long lean torso, I'm looking forward to seeing more pieces! I too started with original sculpey. gross stuff, lol! I rage quit that stuff pretty quick after all the pieces seemed to melt in my hand before I could get much detail. Super Sculpey is MUCH better! I also like paper clay. I like getting the shapes and proportions first and then adding details bit by bit. Paper clay is really conducive for changing your mind and adding and subtracting easily. It just takes some experimenting to decide what works best for you! Best of luck on your doll journey! It's awesome to have you here! You guys are seriously so supportive and I appreciate each and every suggestion you make. I'm keeping a notebook of suggestions and am going to use them as trial and errors and problem solving methods as each one comes up. I'm hoping to have the torso finished tomorrow and will be working on the head next. That honestly terrifies me more than the hands and feet! But I am going to try my best to tackle it. It's funny, I do portrait sketching and am a makeup artist so a face shouldn't be a problem for me and yet the idea of sculpting one is just frightening!